You may not have noticed it, but lately the New York Times has been running a series of long feature articles taking Apple Inc. to task. Whether it be about the human conditions of its manufacturing plants in China, or about its employee welfare in its US-based retail stores, the NYT has been casting a stern eye over Apple’s operations. 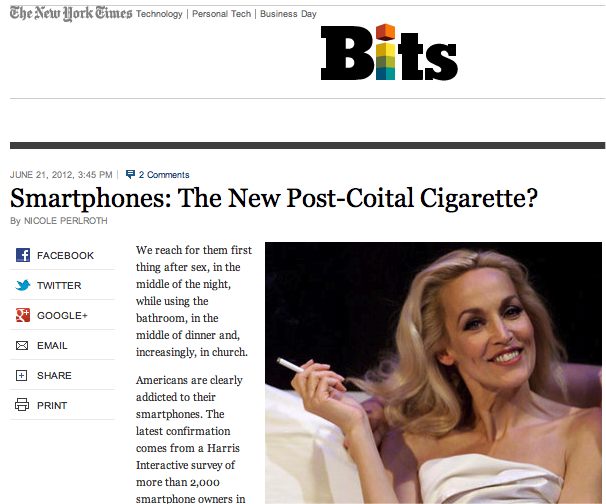 The picture you see is of a rather contented Jerry Hall in the Broadway production of The Graduate where she plays Mrs. Robinson. The article, by Nicole Perlroth, focusses on how smartphones, such as Apple’s iPhone or Samsung’s Galaxy III to name the two most popular examples, are changing certain behaviours, previously taken for granted. To non-Americans, it seems Americans are addicted to calling many things which they perceive to be outside the range of “normal” behaviour an “addiction” with all the stigma and negative stereotyping that goes with it, along with the eventual 12-step program modelled on Alcoholics Anonymous. I get enquiries from local Australian media about such “addictions” and related dangers on a regular basis, being as I am a “go-to” person for journalists seeking local flavour for internationally-sourced articles such as the Times. Psychologists recently tried to coin a name for the fear of losing a cellphone. It’s called nomophobia — which stands for “no-mobile-phone phobia”— and apparently it’s on the rise. The vast majority of survey respondents — 94 percent—said they lived in a perpetual state of fear that they might lose their cellphones. A similar study of cellphone owners four years ago found that only 53 percent felt that way. The first line of the quote caught my attention because it’s the first I’d read that my professional colleagues were at it again constructing neologisms. This is an important concept at the moment as much vigorous debate continues in the world of mental health as the American Psychiatric Association prepares for publication of the fifth edition of its Diagnostic and Statistical Manual (DSM). The Manual is frequently cited in courts of law and insurance precincts as it defines illnesses which can explain illegal actions, provide or restrict workers’ compensation, and allow for admission to hospitals, either voluntary or involuntary. These are some of the purposes to which it is expected to be put, as well as its use in research so as to make sure experimental subjects meet the criteria for inclusion in studies which say might compare various treatment regimes. Thus the multibillion dollar pharmaceutical industry is an interested stakeholder, and some of the misgivings being voiced have centred on those who are developing the DSM and their connections to “Big Pharma”, as it’s referred to often. So, I wondered who these psychologists might be who are “trying” to come up with a new diagnostic term. The two returns that caught my eye as I cast my view down the list were the Wikipedia entry, and the entry of February 20 from the local Sydney Morning Herald: Nomophobia – fear of being without your phone – on the rise. Local entries for me are important to follow up on, to see if any colleagues I know have been sourced, or if something I have blogged about has been cited. What we find is in fact a Los Angeles Times reprinted article, and my journey around the internet echo chamber begins. The term Nomophobia seems to have its most recent mention from an online survey, conducted by yet another online security company, SecurEnvoy from the UK. Like US-based Lookout who commissioned Harris, Securenvoy commissioned OnePoll to do its online survey, replicating an earlier survey conducted in 2008, when apparently Nomophobia was first “identified”. We’ll come to that original article in a moment. So, this is how you go from a fun and light piece where we can all have a little laugh at ourselves and our relationships with technology to a real and treatable illness possibly requiring medication. The original survey says nothing about “symptoms”, but now we have a “real illness” with symptoms not unlike other well known phobias, such as they ones I treat in my psychology practice. The conclusion that “53% of cell phone users, based on the Securenvoy polling will suffer from nomophobia” is plain laughable. 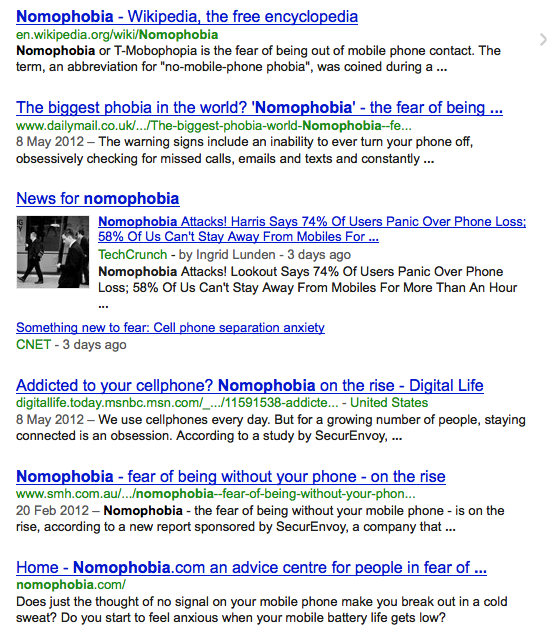 So what was the original 2008 article which first mentioned Nomophobia? Well, it seems to come from the UK Post Office who also commissioned a study of more than 2,000 mobile phone users by YouGov. 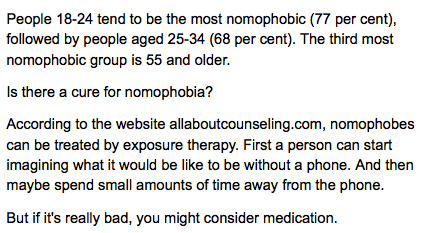 “Nomophobia is all too real for many people. “We’re all familiar with the stressful situations of everyday life such as moving house, break-ups and organising a family Christmas. So this is the inventor of the term, it seems, as even Wikipedia shows no earlier citation than this 2008 UK survey. And my brief research into Mr. Fox-Mills suggests he isn’t a psychologist, but the Head of Marketing for the UK Postal Service. (I tried to locate the original research at the Royal Mail’s website, but the link was dead). So it seems every few years, as smartphones continue to evolve and become the standard communication device, we will see these same surveys dribbling out, the mainstream media echo chamber leaping onto it, dial a quote researchers and dare I say it psychologists asked for their opinion to give the fluff piece gravitas, and more members of the public either thinking they have an illness, or poking fun at psychologists for making up illnesses to drum up business. What is true it seems is that the old saw of “Follow the money” holds true for Nomophobia, and it’s a pity the Newspaper of Record, the New York Times, has got itself caught perpetuating nonsense when a little research could have steered the story to something more useful and interesting, such as the history of moral panics due to generational adaptation to things technological. I located the ZOMM bluetooth-powered device while googling around looking for Bluetooth 4.0 specifications for an upcoming blog post. I so like this easy and inexpensive potential solution for lost iPhone and Android devices (as well as iPads, and more) I thought I’d include a promotional YouTube video, below. Enjoy!